Sports guy Jack Fitzsimmons is soon available. From Virginia, he's now in Burlington. He's an engaging, energetic professional with a charismatic and confident on-air demeanor. If you need a person of substance who viewers find comfortable and credible, look no further! After 4/1, he is available to the top 65 markets with two weeks notice. Please consider him! See all of Jack's clips. 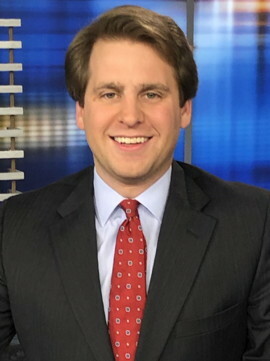 WCAX-TV, Burlington: Weekend Sports Anchor (April 2016 - present). Anchor five to seven sportscasts a week including all four weekend shows. Shoot, edit and produce highlights and packages/VOSOTs covering area teams and athletes at the high school, college and professional levels. Extensive coverage of athletics at the University of Vermont including men’s and women’s basketball, hockey, soccer and lacrosse. Co-host weekly “Friday Football Frenzy” high school highlight show. Frequently report live, often from local automobile short track named Thunder Road International SpeedBowl. Produced weekly series on families of drivers at Thunder Road in 2018. Team player and multi-tasker. WBOY-TV, Clarksburg, WV: Sports Anchor/Reporter (November 2014 – March 2016). Anchored six to ten sportscasts a week. Shot, edited and produced highlights and packages/VOSOTs related to high school, college and professional teams and athletes. Co-hosted weekly “12 SportsZone” high school football show covering 24 area schools for two seasons. Reported live from site of “Game of the Week” during high school football season for station’s 5 and 6 p.m. shows and 5:30 state-wide newscast anchored from Charleston. Extensively covered West Virginia Black Bears inaugural 2015 season including run to New York-Penn League title. WINA-AM, Charlottesville, VA: Sports Department Producer/On-Air Talent (August 2012 – May 2013). Produced and voiced promos for in-house programming including weeknight sports talk show "The Best Seat in the House with Jay James". Syracuse University: M.S., Broadcast and Digital Journalism with Sports Communication Emphasis. The University of Virginia: B.A., History. Minor: Media Studies. Mike McCune (current supervisor), Sports Director, WCAX-TV, Burlington, 802-335-4060. Jay James (former supervisor), Sports Director, WINA-AM, Charlottesville, 434-989-8767. Scott Fleishman (co-worker), Weekend Morning News Anchor, WCAX-TV, Burlington, 508- 932-1195.